So you know having a website for your business is essential nowadays, but how do you drive traffic there? There are many ideas out there for how to get new, prospective clients to visit your site. But what about your current clients? Do they ever return to your site once they are working with you? Back in the day, clients scheduled meetings either by calling your office’s phone number or by showing up at your doorstep. This required a lot of back and forth to find a time that works for both the client and you. With today’s technology, all they need to do is visit your site and pull up your online scheduling app, which is a great way to also get clients to see what else is new with your company! By featuring an online scheduling area on your website, clients can easily see any available dates/times for a quick 30 minute phone meeting or a 90 minute in-person meeting. You also have better control of your calendar and can block off dates that do not work for you and allow clients to schedule around your availability. Below, Twenty Over Ten’s client, Broussard Financial, makes scheduling through their app easy. We often recommend Scheduleonce and Timetrade for our clients’ sites, but you can take a look at which option might be best for your firm in this blog. Regardless of what you choose, scheduling apps will ensure your clients return to your site over and over again. Start driving more traffic to your website by directing your clients to schedule a meeting online through your site! 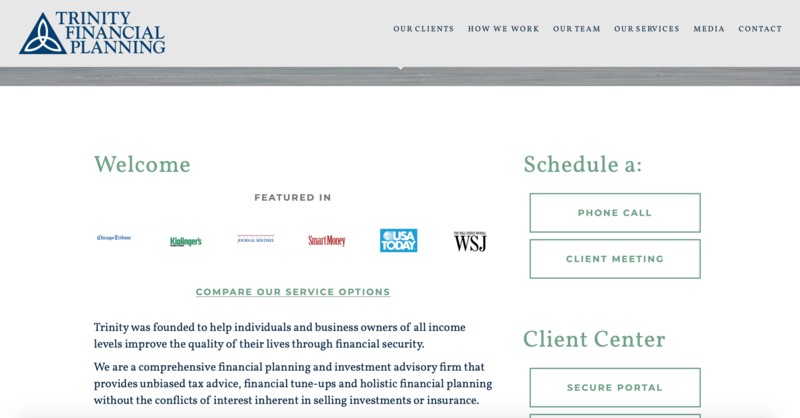 Twenty Over Ten’s client, Trinity Financial Planning, adds their scheduling app on the homepage of their site. At Twenty Over Ten, we make a great use of logins through our website for both our employees and our clients. This is an effective way for your current clients to consistently visit your site to access any information they need and also get the latest company updates in one visit. You might not think about it, but clients will often visit your blog and check out any news/events coming up every time they visit your site to access their logins. 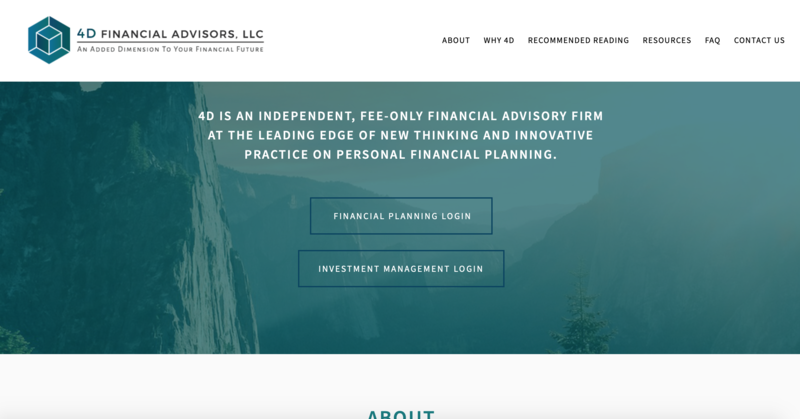 Twenty Over Ten client, 4D Financial Advisors, includes a client login and investment management login button on their homepage for easy access. Through whatever type of industry you are in and a wide range of types of businesses, chances are that clients are going to have to get a form from you, whether that is a simple client information form, a 1040 tax form, a patient history form and others alike. The process of getting these forms often includes them having to physically visit your office and sometimes that is not the most convenient approach. 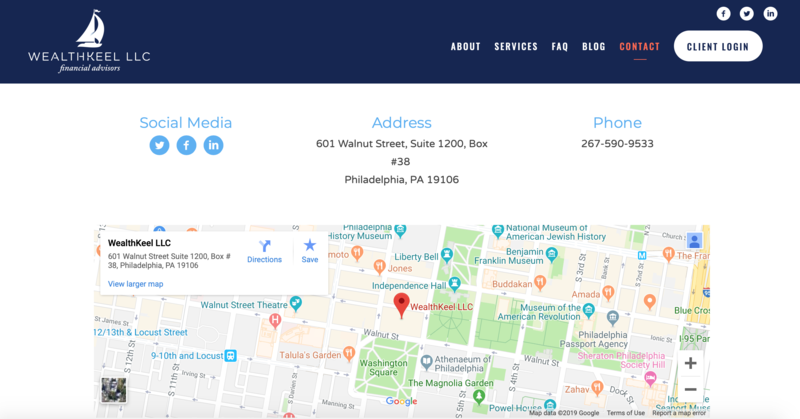 By having popular forms that clients may need access to frequently as part of your site, you can easily direct clients to a specific tab within your website to print them out as many times as they need to. While visiting your site to print these forms, they also another opportunity to learn more about any recent events happening within your company and read your latest blog post. 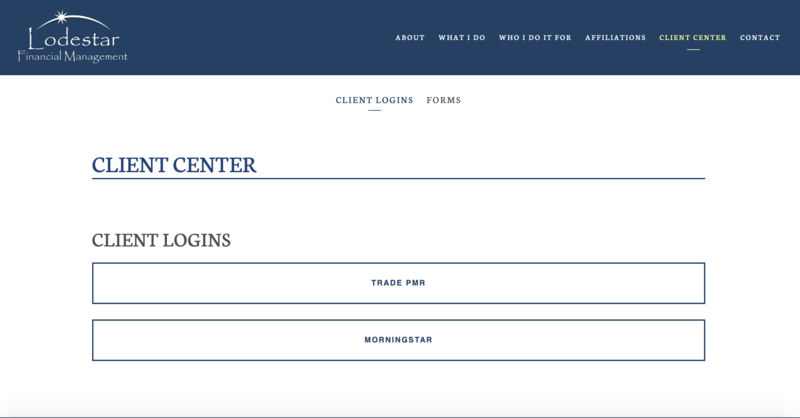 Twenty Over Ten’s client, Lodestar Financial Management, includes a client center to make login easier for clients. One of the best ways to continuously have your current (and also prospective) clients visit your website often is by posting regular blogs and news updates. In combination with sharing these posts on social media (Facebook, Twitter, LinkedIn etc), you can increase the reach of the blog/news posts themselves and increase traffic on your site as well. I find it helpful to share the same blog posts a couple times in a month and play with the wording of the caption you use on each social media post to increase traffic. Since each social media platform also allows you to track analytics, and you will have Google Analytics on your website, you can also track through which caption helped to bring most traffic back to your site. For more help getting your blog started, coming up with ideas, and promoting it on social, check out this article. 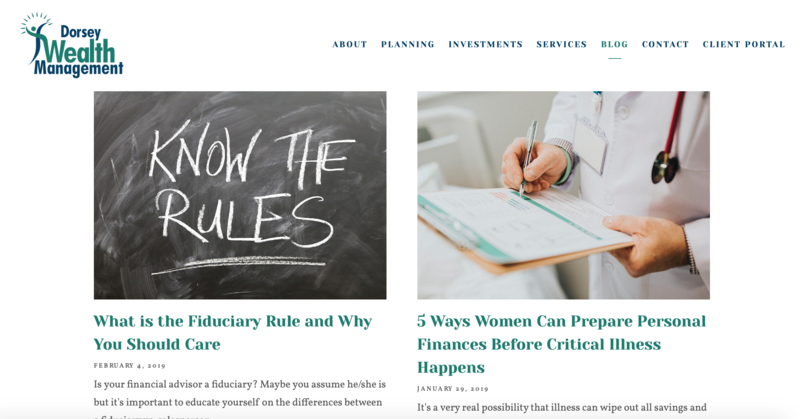 Twenty Over Ten’s client, Dorsey Wealth Management, regularly creates content for their website and social media accounts by writing a blog. A lot of our clients also use apps that help keep together all potential forms that clients might need. This is another great resource to help drive traffic to your company website as clients need to access these forms regardless, and by having this app as part of your website you are encouraging clients to learn a little more about what the company has been up to over the past few weeks since their last visit, all of this while they access their Sharefile or NetDocuments. 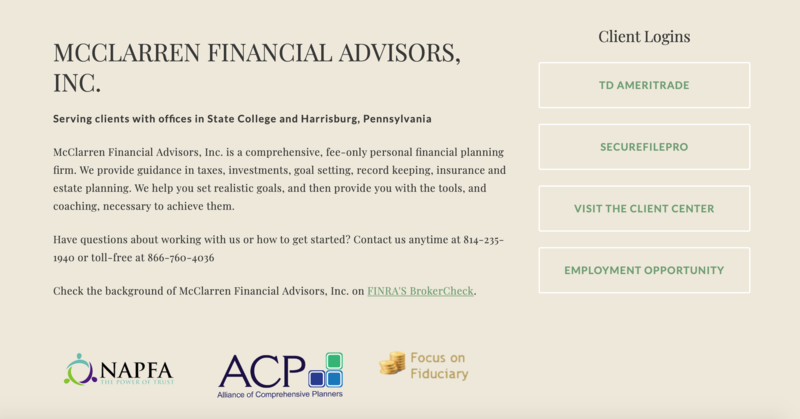 McClarren Financial Advisors, a client of Twenty Over Ten, includes a section of client logins with a link to Sharefile. Implementing website icons is a great way to drive traffic to your social profiles. Website icons stand out against the text on your website and draw attention to these links. 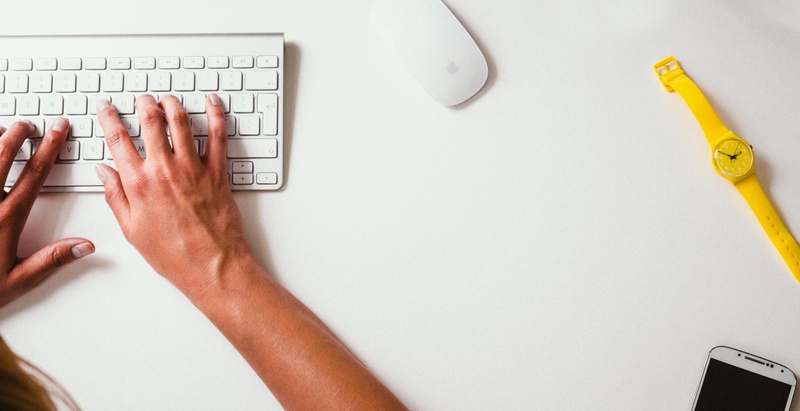 You don’t only want to send clients back to your site – you also want to engage with them on social media! There are plenty of free website icon providers that can generate these for you. We recommend The Noun Project and Flat Icon to our clients. Below, you can see how these icons help important information stand out. This Twenty Over Ten client, WealthKeel, includes social media icons in the top right corner and on their contact page. This stands out and encourages clients to engage with them even more online. Build a Site Your Clients Will Love!